License distinctions, lab-testing requirements & distributor rules: See what California has in store for 2018. 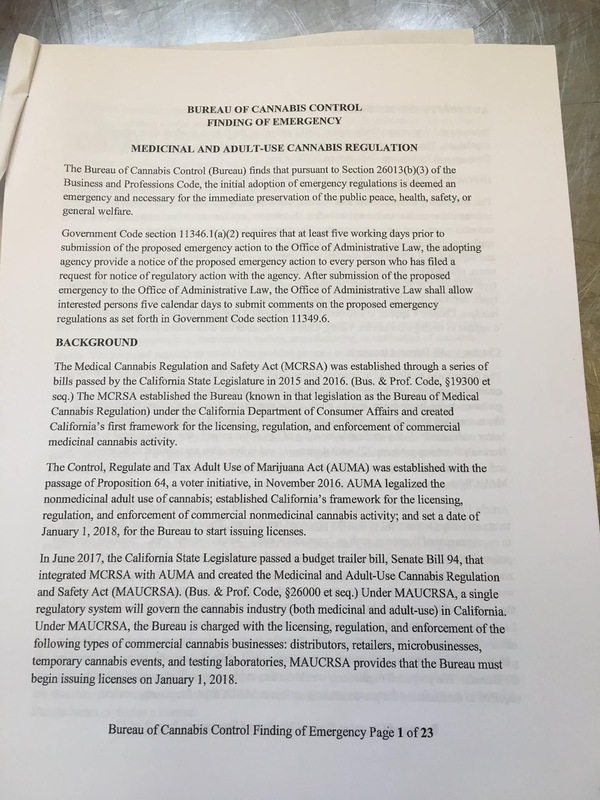 Last week, the California Bureau of Cannabis Control released their proposed emergency regulations for the industry. 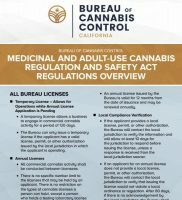 The Bureau, the government agency tasked with regulating California’s cannabis industry, announced the proposed emergency regulations ahead of the highly anticipated January 2018 start date. A-type licenses are for businesses in the adult-use market, while M-type licenses are for the medical market. Laboratory licenses don’t have this distinction, as they can test both medical and adult-use products. The record keeping and security requirements seem relatively straightforward, requiring normal surveillance measures like 24-hour video, commercial-grade locks and alarm systems. The rules also lay out guidelines for disposing of waste, including securing it on the premises and not selling it. 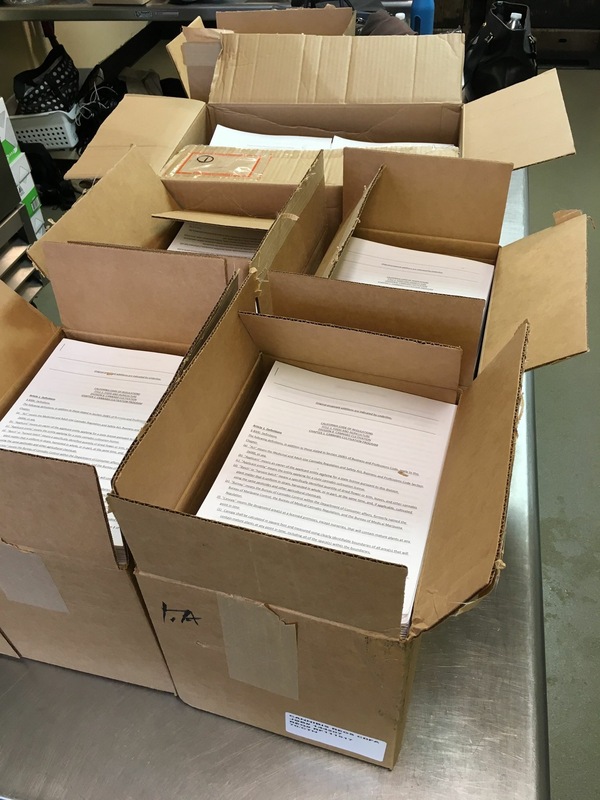 Distributor licenses appear to have a number of compliance documentation requirements, such as arranging for all product testing, quality assurance and packaging and label accuracy. 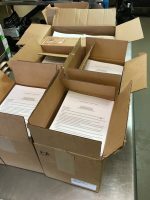 “Cannabis and cannabis products must pass through a distributor prior to being sold to customers at a retail establishment,” reads the overview the Bureau published. There is also a transport-only distributor license option. Those regulations appear to be more comprehensive than others, with a number of regulations pertaining to appropriate transportation and security measures. Everything has to be packaged before it gets to retail; Retailers are not allowed to package or label cannabis products on premises. Microbusiness licenses will be available, which should be an exciting new development to follow as the market matures. The state will require ISO 17025 accreditation for testing labs. A provisional license is required for a lab to operate in the short term, expiring after 12 months. Laboratory personnel are required to go in the field and do the sampling. Documentation requirements, sample sizes, sampling procedures and storage and transportation rules are also laid out. Certificates of analysis (COA) will be required, showing whether a batch passes or fails testing requirements. Harvest batches that fail testing can be processed for remediation. “Testing laboratories are required to develop and implement a quality assurance program that is sufficient to ensure the reliability and validity of the analytical data produced by the laboratory,” reads the statement on QA and QC. In the coming weeks, we’ll be breaking down and analyzing the other proposed emergency regulations that the state released. 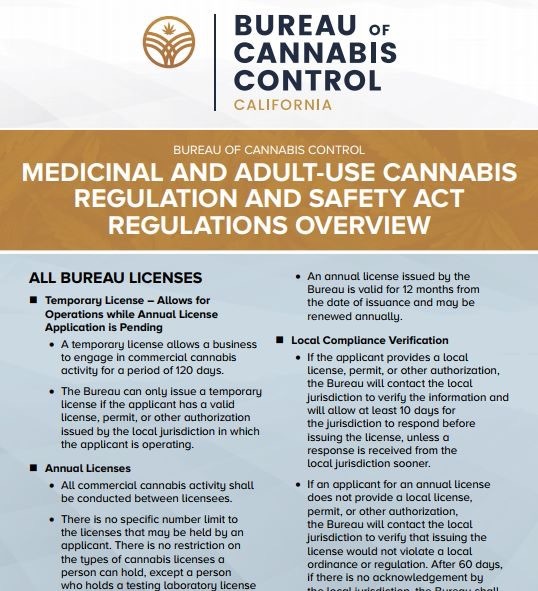 Stay tuned for a breakdown of the California Department of Food & Agriculture (CDFA) regulations on cannabis cultivation, as well as The California Department of Public Health (CDPH) cannabis manufacturing regulations. Aaron G. Biros joined Innovative Publishing LLC full-time after graduating Tulane University in May of 2015. Graduating with a B.A. in Environmental Studies, his coursework involved environmental sustainability, conservation policy, design thinking in collaboration, social innovation & entrepreneurship, food production & health, and environmental & health risk assessments. He has two years of experience working on staff as an associate editor for FoodSafetyTech.com, writing a series of articles focused on the intersection of food safety and environmental sustainability. Aaron is now the editor and publisher of CannabisIndustryJournal.com, a B2B digital trade publication that seeks to educate the global cannabis industry on everything seed-to-sale in both recreational and medical markets. 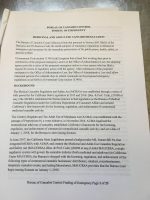 CannabisIndustryJournal.com covers news, business trends, technology, regulatory compliance and other important areas, aiding in the advancement of a well-informed and safe market.